Media: Hardback with glossy dust cover; 300mm x 224mm in portrait format; 208 pages; over 150 photographs; 20 colour profiles; tables; technical drawings. Advantages: Comprehensive text and photo coverage of this unit's formation, aircraft and operations; beautiful colour profiles of German, Italian and Allied aircraft; excellent layout - broken up by tables and sidebars; Appendices with victories, loss reports and Order of Battle. Nick Beale is co-author of the excellent book, "Air War Italy". 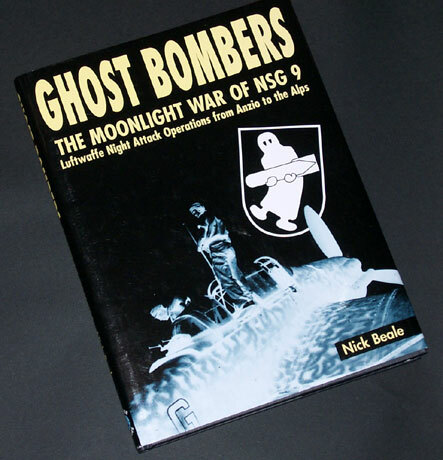 His latest title, "Ghost Bombers - The Moonlight War of NSG 9" is a logical extension of the subject matter in the earlier book. NSG 9 was a Luftwaffe ground attack unit formed in 1943 to perform nuisance bombing at night. This tactic was based on very successful Soviet night operations using obsolete aircraft during the winter of 1941 and 1942. Although the Soviet biplanes caused minimal material damage, the bombing deprived German troops of much-needed sleep - an essential resource during the intense fighting on the Eastern Front. In late 1943, NSG 9 transferred to Italy. The unit initially operated Italian types including the Fiat CR.42 and the widely disliked Caproni 314. By the end of January 1944, the unit started training with the slow but reliable Ju 87 Stuka. The debut of NSG 9 at Anzio made little impact, but later operations were more successful and the unit was greatly appreciated by German ground troops. However, heavy casualties were suffered by the cumbersome Stukas at the hands of Allied Mosquitoes and Beaufighters. The text of "Ghost Bombers" is logically structured, interesting and informative. 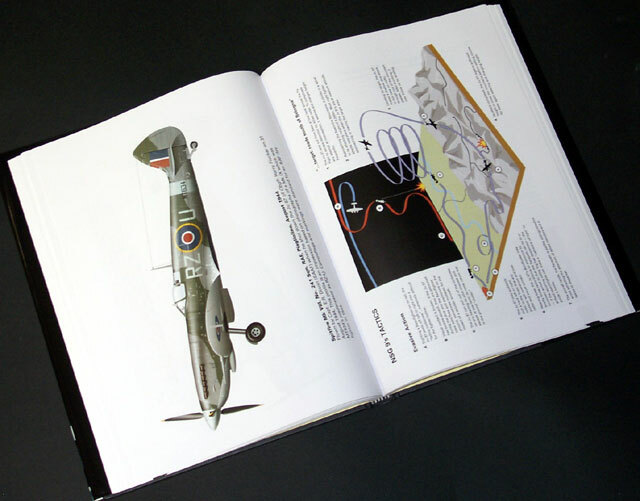 The chapters are peppered with tables and sidebars providing related information such as statistics or a pilot's personal viewpoint. This format ensures that the reading never becomes too heavy despite the relative bulk of the book. In common with Classic Publications other releases, more than 150 photos are a valuable aid to telling this story. Captions are also very useful. Tom Tullis' artwork is another highlight. Tom tries his hand with a few different subjects in this book, including the Arado Ar 66, Caproni Ca.314, Junkers W.34, Fiesler Storch, Fw 190F-8/R1, Fiat CR.42, Beaufighter, Mustang, Spitfire and, of course, Stukas. All 20 profiles are handled with Tom's typically realistic approach to light and shade. Camouflage colours look very convincing too. The book is rounded out with four Appendices - Markings and Camouflage; Allied Victory Claims; NSG 9 Loss Reports and NSG 9 Order of Battle, 31 December 1943 to 22 April 1945. "Ghost Bombers - The Moonlight War of NSG 9" is an excellent reference source about the aircraft and operations of this little-known but fascinating Luftwaffe unit. I am sure it will be appreciated equally by modellers and Luftwaffe historians.